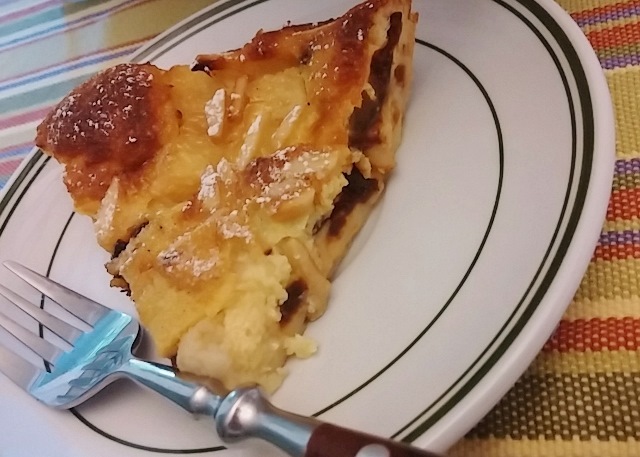 If you are new to this site, then you wouldn’t know about me and clafoutis and that I can’t say no. I have zero resistance. As far as I am concerned it is good morning, noon, and night. And that is likely what will happen today… since dessert is still on the horizon. What’s not to like about a silky crepe-like batter poured over fruit and baked in the oven until puffed and golden? I’m still confounded by the magic that occurs when these two components meld into one blissful package and blossom into a creamy light filling afloat with fruit—snugly surrounded by its own self-imposed crispy light crust. Today’s version was not planned. 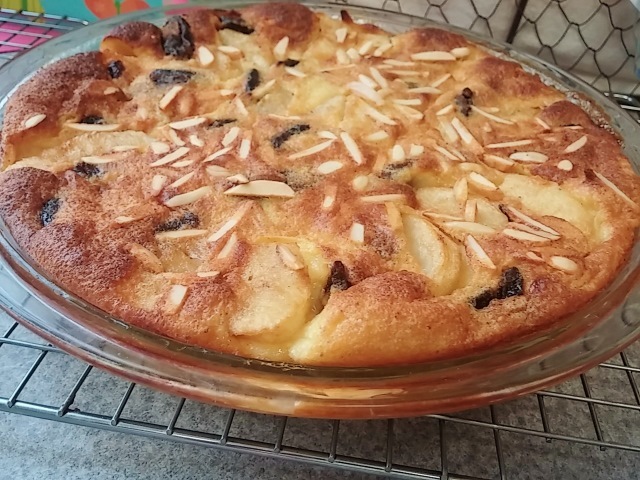 It merely seemed like a good idea to use up the few pieces of lingering fruit: a couple of peaches and a pear and then fill in the gaps with a handful of dried fruit, which happened to be prunes softened in orange juice. A slight touch of almond in the batter and a handful of almonds sprinkled on top manage to make this taste like I started with a plan. Oh, my. Butter an oven proof shallow 9″ casserole dish, quiche dish, or pie plate. Toss the dried fruit with juice or brandy, microwave briefly until hot and let stand until needed. Prepare batter. Warm the milk and the butter together. In a medium bowl, whisk eggs and sugar until frothy, sprinkle in flour, spice, extract, and whisk until smooth. Gradually add warm milk mixture, whisking until well combined. Let stand 1 hour at room temperature. Preheat oven to 350°F. Distribute the fruit evenly in the baking dish. Pour the batter over the fruit and scatter almonds on top. Bake for 40-45 minutes, until puffed and brown. Sprinkle with granulated or powdered sugar. Note: if using apples or other firm fruit, begin with a quick sauté in 1 tablespoon butter, 1 tablespoon of sugar and toss until slightly softened.